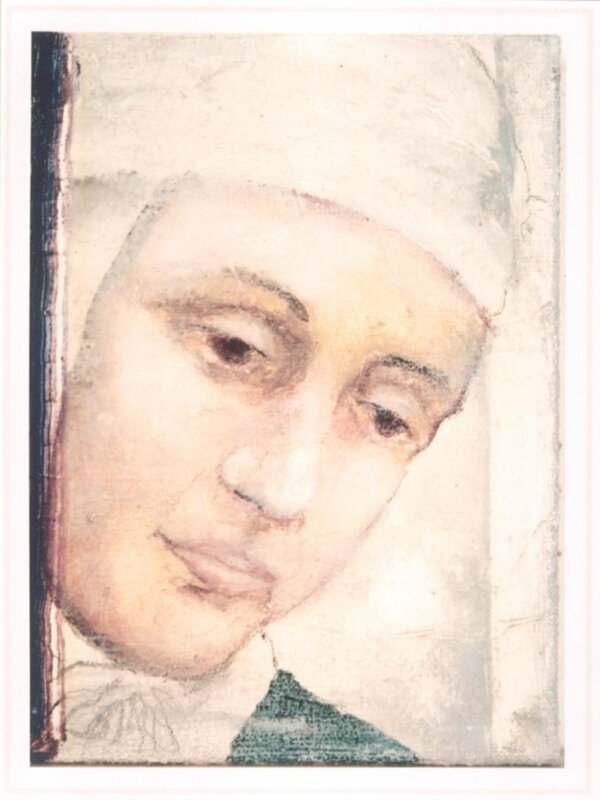 Born at Flamske in Westphalia, Germany, on September 8, 1774, she became a nun of the Augustinian Order at Diilmen. She had the use of reason from her birth and could understand liturgical Latin from her first time at Mass. During the last 12 years of her life, she could eat no food except Holy Communion, nor take any drink except water, subsisting entirely on the Holy Eucharist. 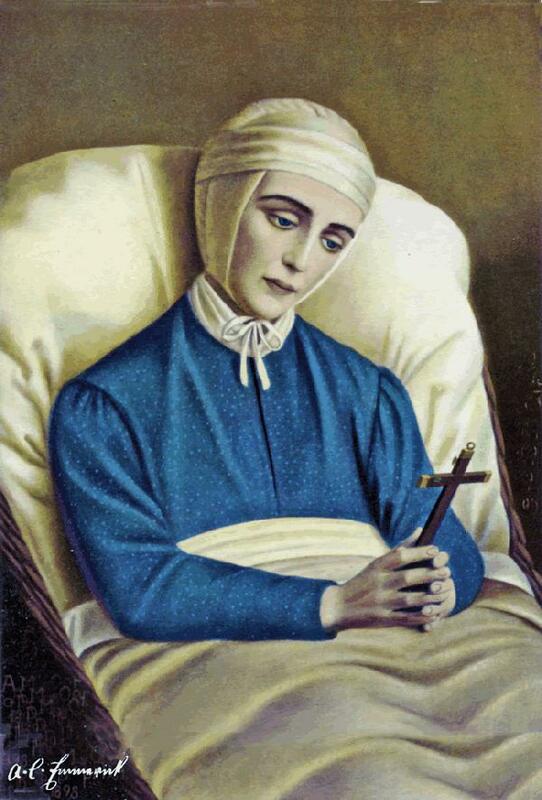 From 1802 until her death, she bore the wounds of the Crown of Thorns, and from 1812, the full stigmata of Our Lord, including a cross over her heart and the wound from the lance. Anne Catherine Emmerich possessed the gift of reading hearts, and she saw, in actual, visual detail, the facts of Catholic belief, which most of us simply have to accept on faith. The basic truths of the Catechism — Angels, devils, Purgatory, the lives of Our Lord and the Blessed Mother, the Real Presence of Christ in the Eucharist, the grace of the Sacraments — all these truths were as real to her as the material world. Thus, her revelations make the hidden, supernatural world come alive. They lift the veil on the world of grace and enable the reader to see through Anne Catherine’s eyes — the manifold doctrines of our Faith in all their wondrous beauty. This book will thus marvelously confirm and strengthen the faith of Catholics, showing that the truths of our Faith are rock-solid realities, as real as anything in the material world. In the King of the World, René Guénon documents Christianity’s loss of its primordial Tradition as the gradual break of the link to its spiritual centre. This break occurred in stages following the period called the Middle Ages. The first break came with the destruction of the Templars, since the Orders of Chivalry maintained a spiritual connection between the East and the West. The Rosicrucians made the effort to continue this liaison. The Renaissance and Reformation completed the break, and the Rosicrucians allegedly retired to Asia. Thus, according to Guenon, no western organisation has maintained full and effective initiatory knowledge. So where does Guenon suggest to look? He turns to two clairvoyants, Emmanuel Swedenborg and Blessed Anne-Catherine Emmerich. According to Swedenborg the ‘lost Word’ must henceforth be sought among the Sages of Tibet and of Tartary, where the mysterious Mount of Prophets of Anne-Catherine Emmerich’s vision is also set. Mountain of the Prophet’ is the name given by Catherine Emmerich to a place high above all the mountains of the world to which she was taken for the first time on Dec. 10th, 1819, in her ecstatic state of dream-journeying, and again several times later. There she saw the books of prophetic revelation of all ages and all peoples preserved in a tent and examined and superintended by someone who reminded her partly of St. John the Evangelist and partly of Elijah—particularly of the latter, since she perceived the chariot which had transported that prophet from the earth standing here on the heights near the tent and overgrown with green plants. This person then told her that he compared with a great book lying before him all the books of prophetic knowledge that had ever been given (often in a very confused state) or would in future be given to mankind; and that much of these he crossed out or destroyed in the fire burning at his side. Mankind, he said, was not yet capable of receiving these gifts, another must first come, and so forth. She saw all this on a green island in a lake of clear water. On the island were many towers of different shapes, surrounded by gardens. She had the impression that these towers were treasuries and reservoirs of the wisdom of different peoples, and that under the island, which was full of murmuring streams, lay the source of rivers held to be sacred (the Ganges amongst them) whose waters issued forth at the foot of the mountain range. The direction in which she was led to this mountain of the Prophet was always (taking into account the starting-point of her journey) towards the highest part of Central Asia. She described places, natural scenery, human beings, animals, and plants of the region which she traversed before being carried up through a lonely and desolate space, as if through clouds, to the place mentioned above. Her detailed description of this place, with all that she experienced there, will be set down in its proper place with an account of her whole visionary journey. On her return journey she was carried down through the region of clouds once more, and then again traversed lands rich in luxuriant vegetation and full of animals and birds, until she reached the Ganges and saw the religious ceremonies of the Indians beside this river. The geographical situation of this place and Catherine Emmerich’s statement that she had seen everything up there overgrown with living green, reminded someone who read her account twenty years later of traditions about a place of this kind (sometimes with a similar inhabitant) in the religions of several Asiatic peoples. The Prophet Elijah is known to the Musulmans (under the name of Chiser -Al Khidr, i.e. the Green One) as a wonderful half-angelic being, who dwells in the north on a mountain known as Kaf, celebrated in many religious and poetical writings, and there watches over secrets at the source of the river of life. The Indians called their holy mountain Meru, while to the Chinese it was Kuen-lun, both connected with representations of a state of paradise and both situated on the heights of Central Asia, where Catherine Emmerich saw the Mountain of the Prophet. Center of the universe in pan-Indian lore, Mount Kailāsa in western Tibet , is the cosmographical analog to the sahasrara cakra (‘thousand-petaled lotus crown’) in Kundalini Yoga and to heaven or moksha (‘liberation’) in soteriological terms. In the second week of Advent, Anne Catherine was led by its angel on the highest peak of a mountain which rises in Tibet and is also completely inaccessible. She lives there, guarded by Elijah, the treasures of all divine knowledge communicated to men by angels and prophets since the world began, and she was informed that the mysterious prophetic book that it was given also came from there. It was not the first time she came into this wonderful place, because she had been led by its angel several times during the course of each ecclesiastical year, she had also been in paradise that seemed not very far away. Both places seemed to have great relationships with each other, and in both she used to meet the same guards saints. She went because the infusion of light and the prophetic task of expiation she had to perform through this light gave him a right to participate in property retained at the location, and because she needed forces and superhuman gifts that were granted to suffice for its task so painful and extended. She could not, as she recognized repeatedly refer to earth as the general impression of what she had seen there, and she was able to reproduce only by very imperfect sketches of the table in which it had seen the effectiveness of the prophetic man of God Elijah perpetuated until the end of time and personal relationships that linked it to him and his office of prophet. “ December 10, 1819. That night I walked in various directions the promised land, as it was at time of Our Lord. At first I was like to go to Bethlehem to meet the Holy Family. I then followed from place to place all roads already known to me and I saw pictures of the life teaching of the Lord. So I saw him distributing bread, the Department of two of his disciples, a multitude gathered around him and after that tell a parable. People sat on the slope of a hill under tall slender trees that had only their crown at the top of the trees were green bushes with red berries and yellow that looked like a little wild blackberries; a course Water fell from the height and shared, there was a very soft grass, fine as silk, and below as a thick foam: I took this turf, and when I wanted to touch other objects, I felt them to escape from my hands and I saw that they were only images of the past: but, on the grass, I had a feeling. The Lord was, as always, a long woolen tunic yellowish hair fell over her shoulders separated, and his face was calm, bright, serious: his face was very white and he came out a light. The two men who distributed the bread broke into pieces: men, women, children, ran to them, comforted, and then sat. Behind the Lord, there was a river. I saw this so many other tables. and went quickly from place to place. From Jerusalem, I went far toward the east. I passed several times in the vicinity of large bodies of water and over the mountains which had been crossed the Magi from the East to come to Bethlehem. I also crossed populous countries, but I do not touched populated places: most of the time I passed by deserts. Then I arrived in a country where it was very cold and I was led to higher and higher until an extremely high along the mountains, from west to east, was heading a highway on which I saw pass troops of men. There was a breed of small, but very lively in his movements: they had with them small flags, those of the other race had a tall: they were not Christians. This road was going down: my path led up to a region of incredible beauty. Here it was hot and everything was green and fertile: there were wonderfully beautiful flowers, beautiful groves and beautiful forests, a number of animals took their antics around they did not seem bad. This region was inhabited by any human being and no man ever went there, for the main road we saw only clouds. I saw troops of animals like little deer with very thin legs and they had no horns, their dress was a light brown with black spots. I saw a stocky animal black almost like a pig, then animals like goats large, but still more similar to deer and they were very familiar, very light in the race: they had nice very bright eyes: I saw others like sheep, they were very fat, had a wig as wool and very thick tails: more like donkeys, but mottled; herds as small yellow goats and ponies: large birds with long legs who ran very fast, similar to other chickens nicely spotted, and finally a nice amount of very small birds and colors. All these animals took their frolics freely, as if they had ignored the existence of men. In this land of paradise, I had to climb higher, and it was as if I was still driving through the clouds. 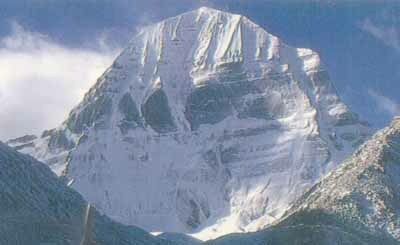 I arrived well at the top of this high mountain area where I saw many wonderful things. At the top of the mountain was a great plain and the plain one lake in the lake a green island which was connected to the mainland by a strip of land also green. This island was surrounded by tall trees like cedars. I was high atop one of these trees and, holding on strongly to the branches, I screw up the whole island. It showed a rising number of very slender towers: each had a small porch, as if we had built a chapel over the gate. These porches were all covered with fresh greens, moss or ivy: there was a continuous vegetation cover, something alive. The towers were about the height of an ordinary church steeple, but they were very thin, so they recalled the tall columns that during the trip, I had seen in old ruined cities. They were of different shapes, round or octagonal. The round had onionshaped roofs: the octagons had large canopies. The rounds were big and veined polished stone, the others had all kinds of projections and foundation forming symbolic images: one could climb to the top, with protruding stones. These stones were of various colors, brown, red, black and arranged in various ways. The towers did not rise above the trees prodigiously high, atop one of which I was. There was, as it seemed, as many rounds in the island of trees around it. The trees were of the species of trees and had leaves like needles: they wore yellow fruit covered with scales, shorter than the cones, rather having the form of ordinary apples. They had very massive trunks and covered the bottom of a rough bark: above, between the branches, they were smoother. The branches formed around it circles very regular: in all these trees had something very symmetrical and they were straight like candles: they were not close to each other and he had that much if they almost touched to the circumference. All the soil of the island was covered with a thick green, thin and short, it was not grass, but a curly-leaved plant very minor, such as foam, as thick and as enjoyable as the cushion the softest. We did not notice the island, or across the country, the least trace of a path or road. Nearly every round was a small garden surrounded by beautiful trees covered with flowers, arranged in a circle or otherwise, and elegantly divided into beds with a variety of shrubs and bedding plants. But again everything was green and the gardens differed in appearance depending on the difference of the towers. When the top of my tree I’d take my eyes on the island, I could see the other end of the lake, but not the mountain. This water was bright and limpid extraordinary: she crossed the island by various arms and drained by several underground channels of varying widths. “Vis-à-vis the narrow strip of land in the green plain, stood a very large tent extending along, which seemed of gray cloth, and was decorated inside, on the behind, large swathes of cloth of various colors and covered with all kinds of figures painted or embroidered. Around the table that stood in the middle, were stone seats without backs in the form of cushions and were covered with greenery always fresh. On the seat of honor in the middle, behind the stone table that was low and oval, a man surrounded by a halo of saints like sat cross-legged in the oriental manner, and wrote with a pen reed on a large volume. The pen was like a twig. Right and left we could see several large books and scrolls rolled on rods tipped with buttons, and near the tent there was a hole in the earth seemed covered with masonry and where was a fire whose flame was less than not the edge. All the surrounding country was like a beautiful green island surrounded by clouds. The sky above my head was an inexpressible serenity. I saw the sun than a semicircle of rays shining behind the clouds. This semicircle belonged to a disk that seemed much larger than ours. The overall look was something unspeakably holy, it was a solitude, but full of charm. This show when I was under the eyes, it seemed to me to know and understand what was and what it all meant, but I felt that I could not bring with me and keep this knowledge. My driver had been with me so far, but near the tent, he became invisible to me”. “As I considered all this, I’m thinking, ‘What have I to do here, and why should a poor creature like me track these things! “Then the figure said to me from under the tent:” It’s because you have a hand in this. “This redoubled my amazement and I went down and I flew to her in the tent where she sat, dressed as are the spirits that I see: it had in its exterior appearance and something thatreminded Elijah or John the Baptist: books and numerous volumes that were on the floor around it were very old and very precious. On some of these books were ornaments and figures of embossed metal, such a man holding a book in hand. The figure tells me or introduced me to another way that these books contained all that was most holy among men that came from, she was examining, comparing everything and threw what was wrong in the heat lit took the tent. He said he was there so that nobody could get there he was assigned to watch over all that and kept it until the time had come to use it. This time could have come already in some occasions, but there were still major obstacles. I asked him if he had not the feeling of waiting so long imposed upon him. He replied: “In God there is no time. “He also told me that I had to see everything, took me out of the tent and showed me the surrounding country. The tent was about the height of two men: she was as long by the church in the city: its width was about half its height. There was at the top node of a species in which the tent was like hanging on a thread that rose and disappeared into the air, so that I could not understand where he was attached. Across the columns were that you could almost kiss with both hands. They were like towers veined polished surface and ended in the green buttons. The tent was open in front and sides. In the middle of the table was a book of extraordinary dimensions that could open and close: it looked like it was subject on the table. The man looked in the book to check its accuracy. It seemed that there was a door under the table and a great and holy treasure, a holy thing was kept there. those who were left had to be burned. It took me about these books: there were figures on the covers of all kinds: they were men wearing stairs, books, small churches, towers or shelves. He said he was considering all this, confronted him, and burned what was wrong and unnecessary. The men were not yet able to bear what was there: another was to come before. What was left was rejected. He then showed me the surrounding country, and I did, along the outside edge, around the lake whose surface was perfectly level with the island. This water, which I felt running under my feet, flowed under the mountain through many channels and reappeared the day well below, in the form of large and small sources. It seemed that all that part of the world received this salvation and blessing from above, it overflowed nowhere. Going down to the east and south, everything was green and covered with beautiful flowers; the west and north, there was also the green but no flowers. Arrival at the end of the lake, I crossed the bridge without water, and went into the island that I traveled in circulating among the towers. All the ground seemed to be a very thick bed of moss and very strong, it seemed that all was hollow underneath, the towers were coming out of the foam as a natural outgrowth, and around each of them, was a garden through which flowed the streams which flowed into the lake or coming out of the lake, that I can not make it clear. In these gardens also, there was no path, and yet the trees, bushes and flowers were arranged symmetrically. I saw the roses, but much larger than ours: there were reds, white, yellow, others dark and I saw the flowers very high, species of lilies, some of which were blue with white stripes, and also a rod height of a tree with large palm leaves, which was at its apex a flower like a very large plate. I felt that the towers were kept in the greatest treasures of mankind: it seemed as if there lay the bodies of saints. Between some of these tricks I saw a very strange carriage with four low wheels: four people could sit well, there were two benches and a small seat in front. This tank, like everything else here, everything was covered with green vegetation or a green rust. There was no tiller and all decorated with carved figures, so that at first glance I thought he was there people sitting. The box was made of these figures worked to date: it was very thin, and as metal: the wheels were thick as those of Roman chariots. It seemed light enough to be pulled by men. I watched everything very carefully, because the man had told me: “You have your share here and you can immediately take possession. “I could not understand at all what kind of hand I could be there. What have I to do, I thought, this singular carriage, these towers and these books? But I had a vivid impression of the holiness of the place. For me it was as if, with this water, the salvation of many ages had descended into the valleys and as if the men themselves came from the mountains where they had fallen still lower, and always had sunk deeper. I also feel that there were heavenly present preserved, maintained, cleansed, prepared in advance to men. I had a perception of all this very clear but it seemed that I could take with me this clear: I kept only the general impression. “When I entered the tent, the man said again the same thing:” You have a hand in all this and you can immediately take possession. “And when I pictured my ineptitude, he said with quiet confidence: “Come back to me soon. “He did not leave the tent while I was there, but it always turned around the table and books. The table had not pushed as much green as the seats: they generally were less green than neighboring objects of the towers, because here there was less moisture. However in the tent and all around the ground was covered with moss. The table, as also the seats, was something that gave the idea of a plant product. The foot of the table appeared to be a safe and there was something holy in it. In the tent, I felt a holy body was buried there: it seemed that there was a tunnel below, and a sweet odor exhaled a sacred tomb. I felt that man was not still in this tent with books. He welcomed me and told me about as if he had known he had known that I had come: he told me the same assurance that I would come back and showed me a path going down and I went in southerly direction, I passed again by the steep part of the mountain, then through the clouds, and I went down to the smiling country where there were so many animals. I saw many small springs gush from the mountain, rushing cascades and run down: I also live birds, larger than a goose, almost the color of a partridge, with three nails and a single front behind, with a tail a little down and a long neck, and other birds plumage bluish, not unlike the ostrich, but smaller: I finally saw all the other animals. “In this trip, I again saw many things and more human beings than in the first trips. I once crossed a small river, which, as I knew inside, out of the lake from above: later I followed the edges, then I lost sight of her. Then I came to a place where poor people of various colors stood under mounds. It seemed that they were Christian captives. I live next to them other men of dark complexion, with white cloths around their heads. They carried their food in wicker: they did that by extending the arms forward as if they were afraid, and then they ran away, frightened look, as if they had been exposed to some danger. These people lived in a city in ruins and lived in huts lightweight construction. I also live in water where reeds grew thick and strength quite extraordinary. I then went back near the river: there, it was very wide, strewn with reefs, islets of sand and beautiful group of plants from which it was played. It was the same river which came from the mountain and I had crossed earlier, when still a small quantity of dark complexion people, men, women and children, dressed in different ways, were occupied on the rocks and streams to drink and wash. They seemed to be from afar. There was in their way of being something that reminded me that I had seen on the banks of the Jordan in the Holy Land. He was there as a tall man who seemed to be their priest. He filled the vases with water they carried. I saw many other things: I was not far from the country was St. Francis Xavier: I crossed the sea in going over countless islands. “Dec. 22. I know why I went to the mountain: my book is among the writings that are on the table: I will be made for me to read the last five leaves. Man sitting at the table will return in time. His chariot stays there as eternal memory. On this chariot he mounted at that height, and men, to their amazement, the will descend on this tank. This is, on this mountain, which is the highest in the world and nobody can happen, what have been secured, when corruption has increased among men, treasures and sacred mysteries. Lake; file, the towers are only available for these treasures are preserved and secured against damage. It is by virtue of the water on this summit is that all things are refreshed and renewed. The river that goes down from there and from which water is the subject of such veneration for the men I’ve seen, really a and strengthens virtue, which is why they consider more than their wines. All men, all goods are down from this height, and all things that should be guaranteed the devastation has been preserved. “The man on the mountain known me: because I’ve got my share. We all know, we all take together. I can not express it well, but we are like a seed sown in the world. Paradise is not far away. I have already seen previously how Elijah still lives in a front garden paradise. “Dec. 26. I saw again the mountains of the prophets. The man who is in the tent had a figure from the sky, hovering above him pamphlets and books, and he received other instead. This spirit was different from the first one outside. He who hung in the air reminded me forcibly John. He was more agile, quicker, kinder, more gentle than man in the tent, which was something more energetic, more severe, more strict, more inflexible. The second was related to him as the New Testament to the Old, which is why I would call John and I would call the other Elias. It was as if Elijah had revelations to John who had their accomplishment in and received fresh. “I saw the church of St. Peter and an enormous amount of men working to overthrow it, but I also saw others who were making repairs. Lines occupied maneuvers of this double work extended across the world and I was surprised all with which everything was done. The demolition of detached chunks and it was particularly large numbers of sectarians and apostates with them. These people, doing their work of destruction seemed certain requirements and follow a certain rule: they wore white aprons lined with a blue ribbon and trimmed pockets, with trowels stuck in the belt. Moreover, they had clothes of every kind: he was among them men of distinction, big and fat, with uniforms and crosses, which however did not put themselves out to work, but marked on walls with a trowel places where we had to demolish. I saw with horror that there were also Catholic priests among them. Often when they did not know how to do well, they approached, in order to educate, one of them who had a great book where it seemed that all the ways to build and demolish were described. So they marked off with a trowel again exactly one point which was to be attacked and on which the demolition was promptly made. These people destroyed with great calm and a steady hand, but timidly, and stealthily eye on the watch. I saw the Pope in prayer: it was surrounded by false friends who often did the opposite of what he prescribed. I saw a little black man (he was a layman) to work the ruin of the church with great activity. While the church was demolished and on one side, it is rebuilt on the other side, but with very little enthusiasm. I saw several members of the clergy I knew. The vicar general gave me great joy. He passed on, unperturbed, and dismantlers through gave orders to maintain and repair. I also saw my confessor dragging a large stone which he brought into a long detour. I saw others say their breviary casually and intermittently bring under their coat a small stone or present to others as if it were a great rarity. They all seemed to have no confidence or ardor or method, and absolutely ignorant of what it was. It was deplorable. 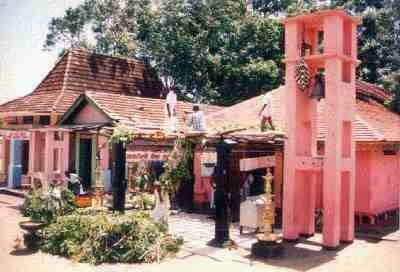 Already the anterior part of the church had fallen: there remained standing but the shrine with the Blessed Sacrament. I was overwhelmed with sadness and I always wondered where was this man I had once seen to stand on to defend the church, wearing a red dress and holding a white banner. Then I saw a woman full of majesty to advance into the great square before the church. She had raised her ample cloak on both arms and rose slowly into the air. She landed on the dome and spread over the whole of the church which his coat of gold seemed to glow. “Dec. 30. I again saw the church of St. Peter with its high dome. Saint Michael sat atop bright light, wearing a red dress with blood and clutching a large banner of war. On earth there was a great fight. Greens and blues fighting against whites, whites and those who had above them a sword and flaming red, seemed to have the below: but no one knew why they fought. The church was red with blood as the angel, and I was told it would be washed in the blood. The fight lasted longer, more bloody color faded from the church and it became increasingly clear. But the angel came down and went to whites and I saw him several times before all of their cohorts. Then they were animated by a courage not wonderful that they knew where they came, it was the angel who multiplied his blows among the enemy, who fled in all directions. The fiery sword that was above the white victorious then disappeared. During the battle, troops of enemies continually passed on their side and once he came a very numerous. Above the battlefield, troops of saints also appeared in the air: they showed, indicating what to do, waved with his hand: they were all different, but inspired by the same spirit and acting in the same mind. “When the angel had descended from the top of the church, I saw above him in the sky a large illuminated cross on which the Saviour was tied, went out of his wounds shining ray beams that spread to the world . The wounds were red and bright like doors whose center was the color of the sun. He was not wearing the crown of thorns, but of all the wounds of the head went rays that were moving horizontally across the world. The rays of the hands, feet and side were the colors of the rainbow sky, they were divided into very tiny lines, sometimes also they met and thus reach the villages, towns, houses throughout the Earth’s surface. I saw them here and there, sometimes far, sometimes closely, falling and dying on various sucking the souls who, entering one of these colored rays, in penetrating wound of the Lord. The rays of the wound on the side of the church were spreading placed below, as a current very abundant and very broad. The church was all lit up, and saw most souls enter the Lord through this stream of rays. “I also saw hovering on the surface of the sky a glowing heart of a red light, which left a path of white rays leading into the wound in the side and another path of rays that spread over the Church and on many countries, these rays attracted to them trèsgrand a number of souls who, by the heart and the way light, entered the side of Jesus. I was told that the heart was Mary. In addition to these rays, I saw all the wounds of the scales are lower to the ground, some do not quite reached. These scales were of different shapes, narrow or wide, with steps that stretched more or less far. They were either isolated or pressed against each other, he could easily have thirty. They were, according to the colors of purgatory, dark at first, then clearer, a gray shade and illuminating as they rode. I saw many souls climb painfully on these scales. Several rose quickly, as if someone helped them and did not cease to advance, while others crowded confusedly and fell on lower levels, some fell completely in darkness. The effort with which they were climbing was very touching, joyous compared to the attraction to which other obeyed. It seemed that those who continued to rise, aided in their ascent, were in a more intimate relationship with the church as were prevented, arrested, abandoned, precipitated. I also saw many of those souls whose bodies were left on the battlefield, each taking their way to enter the Lord’s body. Behind the cross, in the depths of the sky, I saw a whole series of paintings depicting a distance away that was still preparing the work of redemption, but I have no words to express it all. It seemed that these were the stations in the path of divine grace through the history of the world until his final term in redemption. I did not stay in the same place. I moved from side to side across and between the spokes, and I saw everything. Ah! what I saw was immeasurable, indescribable. I also live suddenly as if the mountain of the prophets was pushed to the cross and close to her, but she was rooted to the ground and remained united with it. She presented the same appearance as in the first vision, and above, behind her, I saw bright beautiful gardens all I could see where animals and plants bright; I felt that it was Paradise . “While the battle ended with the land the church and the angel, which soon disappeared, had become white and bright. The cross also vanishes and in its place stood on the church a great woman of brilliant light that stretched far above her coat gold shining. In the church was seen to effect a reconciliation accompanied by evidence of humility. I saw bishops and pastors to approach each other and exchange their books: sects recognize the Church into his marvelous victory and by the light of the revelation they had seen with their eyes shine on it. Those lights came from the rays of the water jet that St. John had struck the mountain lake of the prophets. When I saw this meeting, I felt a profound sense of the approach of the kingdom of God. I felt a glory and a higher life occur throughout nature, and a holy emotion take over all men as when the Lord’s birth was near, and so I felt the approach of the kingdom of God that I felt compelled to run to meet him and shouts of joy. (note). 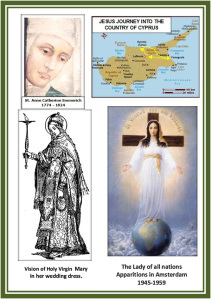 I was already feeling the accession of Mary in his early ancestors. I saw their stock is ennobling as it approached the point where it would produce this flower. I saw Mary arrive, how that I can express, it’s the same way I have always a presentiment of a reconciliation of the kingdom of God. I can not compare to this other feeling that I mentioned. I saw him approaching, attracted by the joggle desire of many Christians, full of humility, love and faith, it was the desire that attracted him. I live in the land of small bands of light lambs led by shepherds, and I saw all these shepherds as shepherds of one who, as a lamb, he gave his blood for us all there was in Men infinite love and power of God. (Note) She did this for the vision by praying aloud. I saw that I knew and shepherds who were close to me, but never suspected any of this, and I was very eager to awaken from their slumber. I was excited like a child that my mother was the church, and I had a very striking vision of my childhood years, when our teacher kept telling us: “He who does not look like the Church his mother does not look like his father God. “I had become a child again and I thought, as then:” The church is stone, so how can it be my mother! Yet it is true she is my mother! These visions of the Church is soon lost in a great vision of the heavenly Jerusalem. I live in the streets of the brilliant City of God a number of palaces and glorious gardens in which troops were moving countless saints, praising God and acting from above on the Church. In the heavenly Jerusalem, there is no church, Christ himself is the church. Mary his throne above the city of God and over which Christ and the Blessed Trinity. Thereof, he falls on Mary as a dew of light that Mary is spreading across the holy city. I live below the city of God Church of St. Peter and I had great joy in that, despite all the indifference of men, yet she still receives her true light from above. I saw the roads to the heavenly Jerusalem, and I saw the holy pastors who lead it to the souls of the elect taken in their herds. On these roads the crowd was not very great. “And I saw my way to the city of God and I live there, as the center of a wide circle, all those to whom I was helping in any way. There I saw all the children and the poor for whom I had items of clothing, I was surprised and I am particularly pleased with all kinds of ways by which I had cut the clothes. A characteristic feature of the naive simplicity of this soul so favored and so heroic in his sufferings, is that after this great contemplation regarding the path that would lead to the heavenlyJerusalem, the most vivid recollection was that he had left acts which, in ordinary life, caused him joy the most sensitive, namely, its handicrafts for the sick and poor children. Day and night, amid all his sufferings, in the waking state or contemplative state, she was busy tireless charitable work of this kind, and perhaps the candor of this modest soul who did not know whether completely itself never manifested itself with more charm than the sweet joy in it: it was penetrated, every time she had completed a supply of garments made by him for poor children.